February | 2013 | Arthur in the Garden. More Spring bloomers and trimming of the beauty bush. 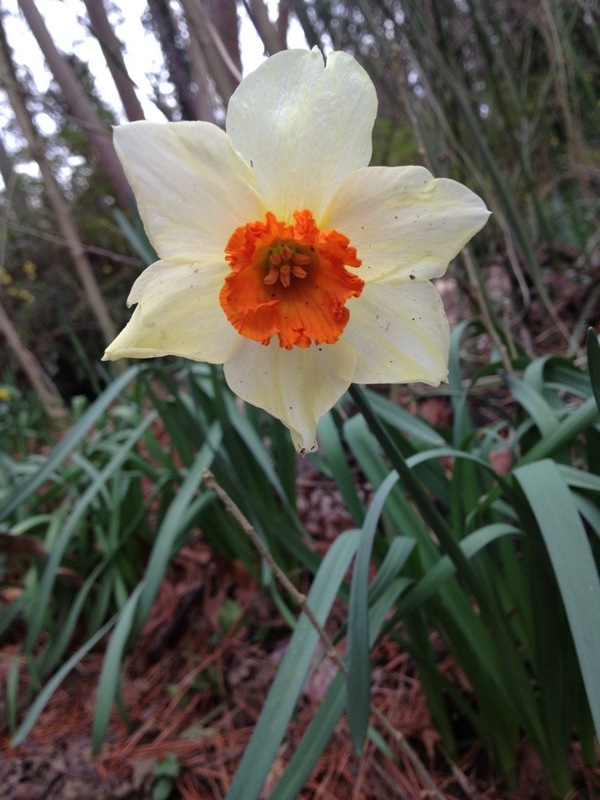 More Spring bloomers are making an appearance. 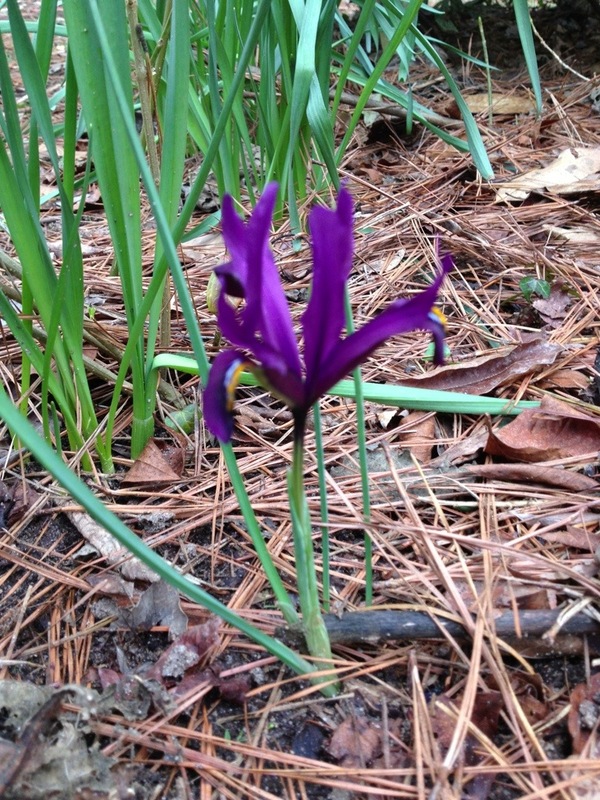 Daffodils and crocus but also a Iris reticulata. This species tends to putter out after a few season and this is the only one I have seen this year out of the dozen I planted a few years ago. Digging in the yard and garden of this house built in 1959 I find many unusual things. 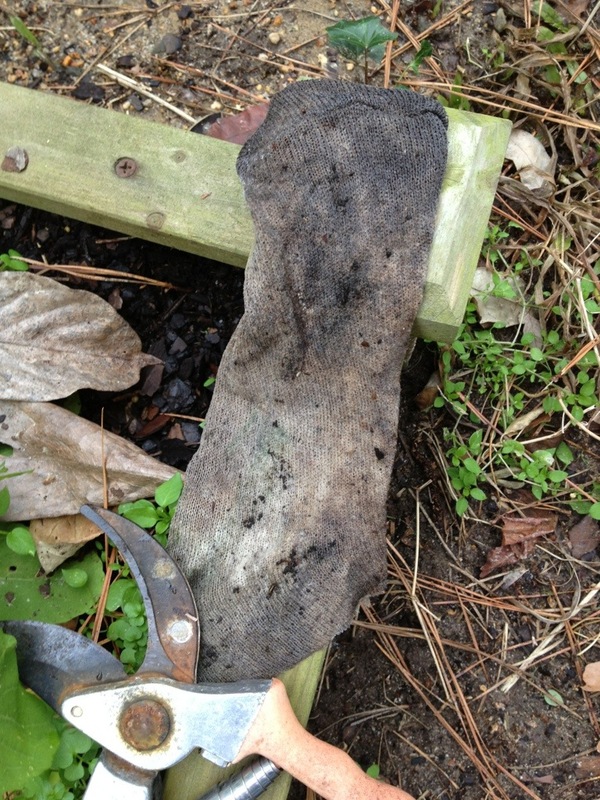 I found this sock today in the vegetable garden. The raised beds were filled with bags of garden soil years ago so I guess it has been in there for a few years! A few days ago I was leveling a stepping stone a mole had disturbed and found concrete with a pipe sticking out of it. I guess the previous owner had some sort of bird feeder or plant hanger? 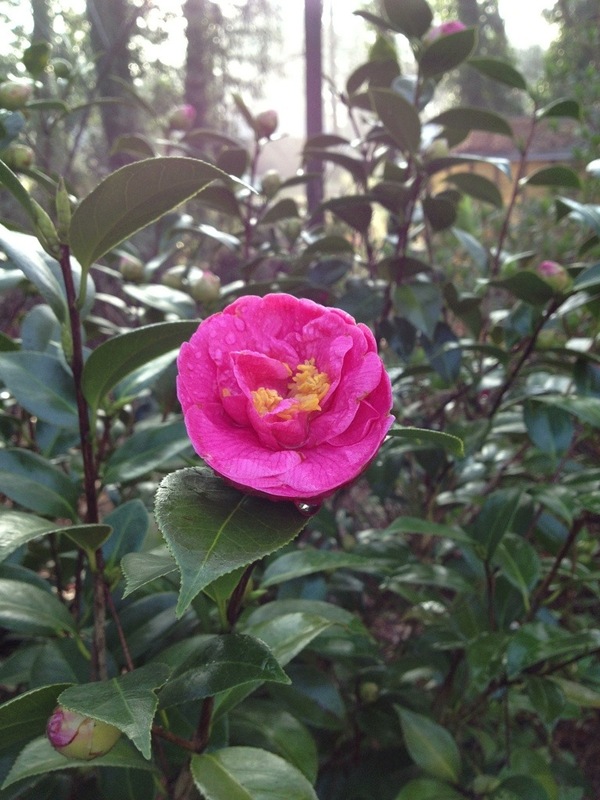 Or she may have placed it there to support this camellia? I usually find a brick or a piece of pipe placed next most of the old shrubs in the yard. When the neighborhood was built in late 1959 this was way out in the country! Now it is only a few miles from the old downtown area. 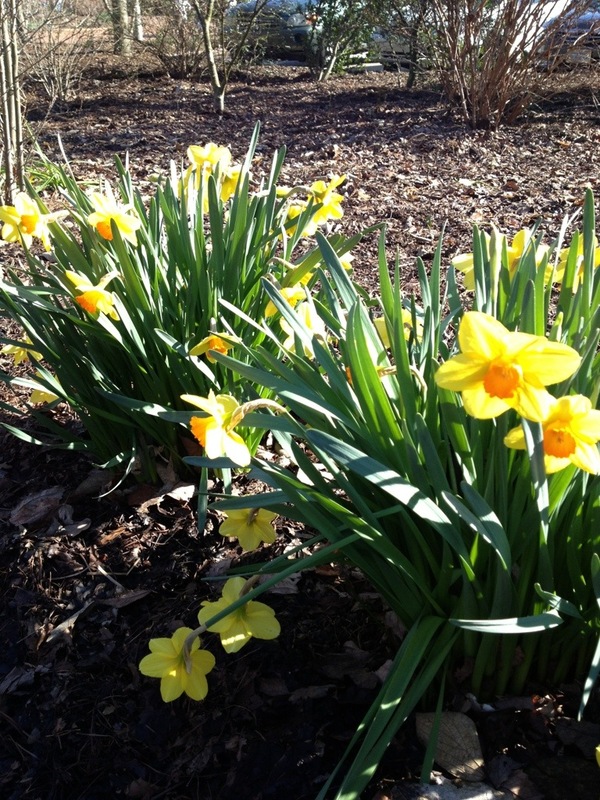 Saturday was cloudy and raining but Sunday was a nice sunny day with temperatures about 61f. After sipping an iced double mocha latte, people watching, and reading the various newspapers in the recycle bin at Cup-A-Joe, we were beginning to get hungry! Its one of those days when you want something very comforting to eat but you’re not sure what will exactly hit the spot. Grilled cheese sandwich? No. 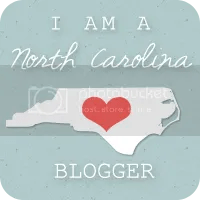 Out to one of the many restaurants or bars in downtown Raleigh? No, again. Its one of those times when walking around the NC Farmers Market on the backside of NCSU’s Centennial Campus for inspiration helps. Letting what’s in the market set the meal is always a nice surprise! Spices of your choice: this time; a pinch of nutmeg. A bay leaf is good, too! 1) Melt the butter in a large pot, and cook the onion then add the cubed and seeded squash (well, mostly seeded) and cook for about 5 minutes, or until lightly browned. Pour in enough water to cover the vegetables. Bring to a boil. Reduce heat to low, cover the pot, and simmer 40 minutes, or until all vegetables are tender. 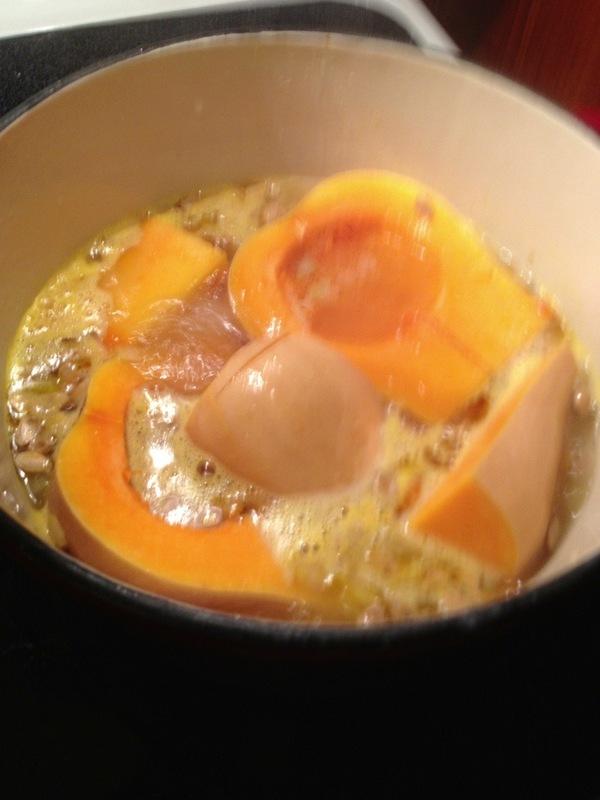 2) Strain the soup to remove seeds and skin you might have missed. 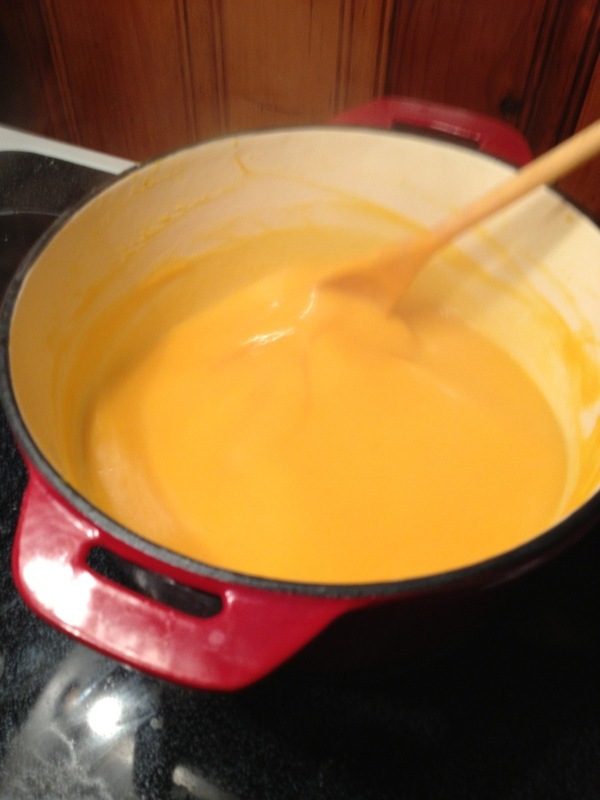 3) Transfer about a quarter of the soup to a blender, and blend until smooth. 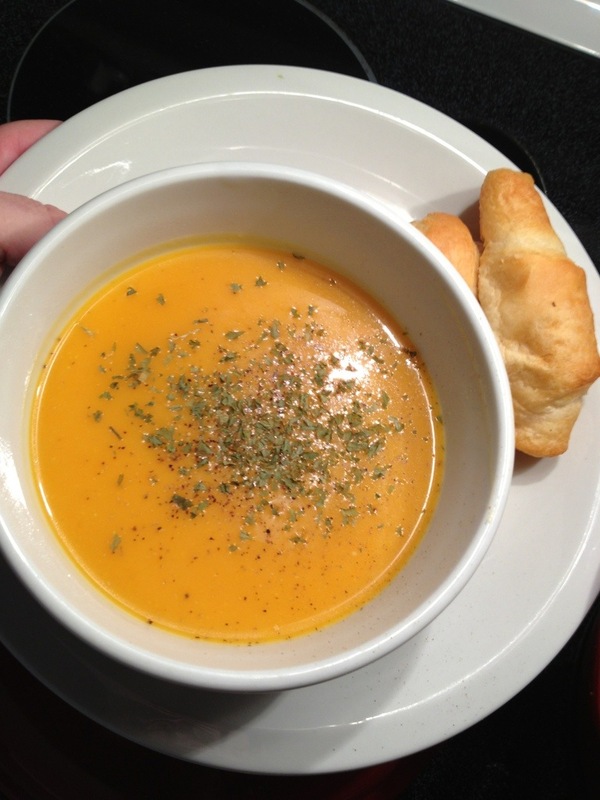 Repeat until all the soup has been blended and is smooth. Return to pot, and add milk to attain desired consistency. Season with salt and pepper. Add spices and remove the bay leaf. 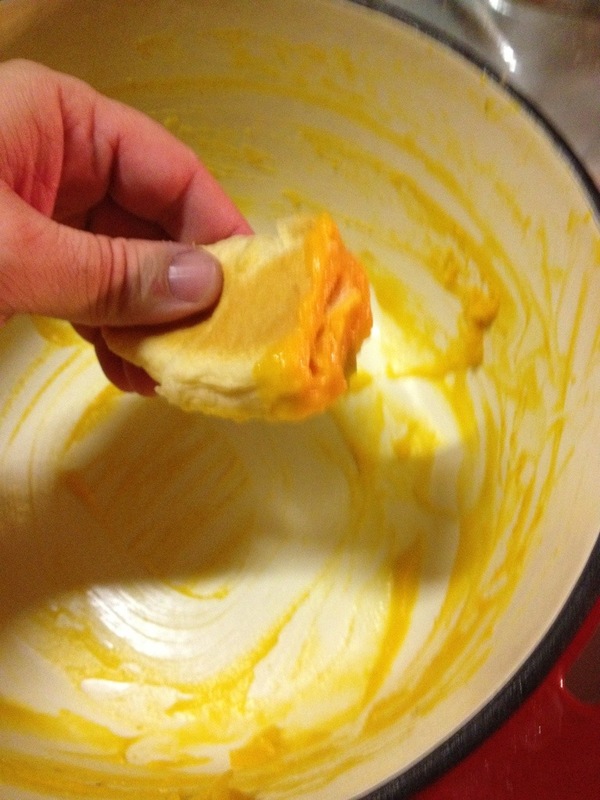 4) Serve with a sprinkle of herbs or cheese, salt and pepper. And as a reward for cleaning the dishes you get to clean the pot with a croissant! 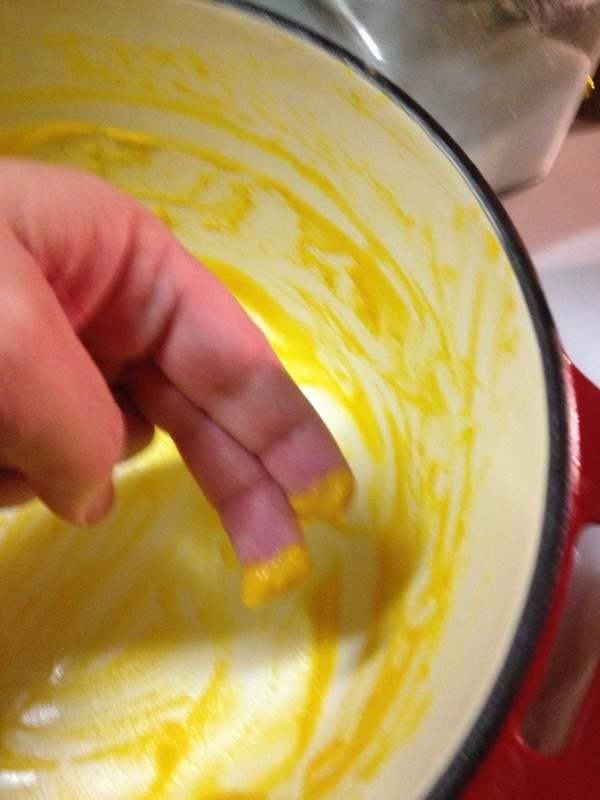 Or you fingers if you have no bread! Of course, you should remember to compost all your vegetable scraps! It is almost time to plant the cool season veggies! 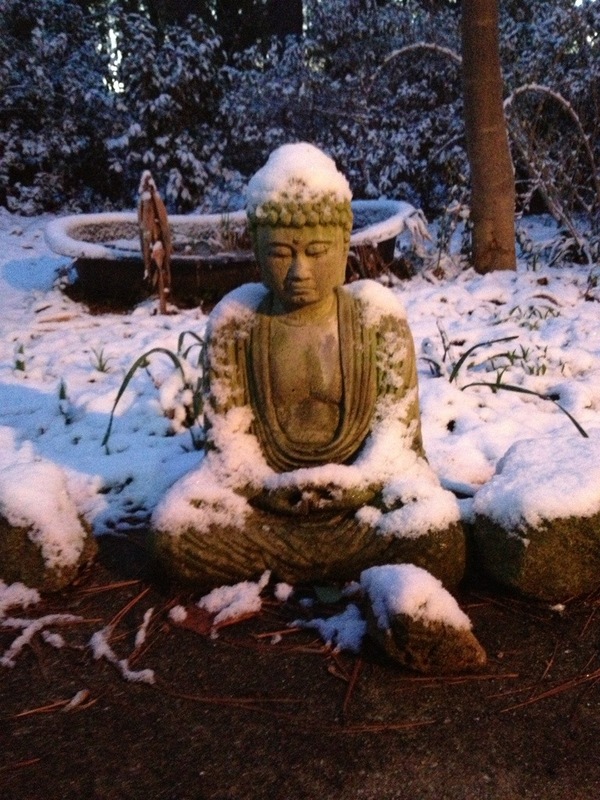 A little snow in the garden. 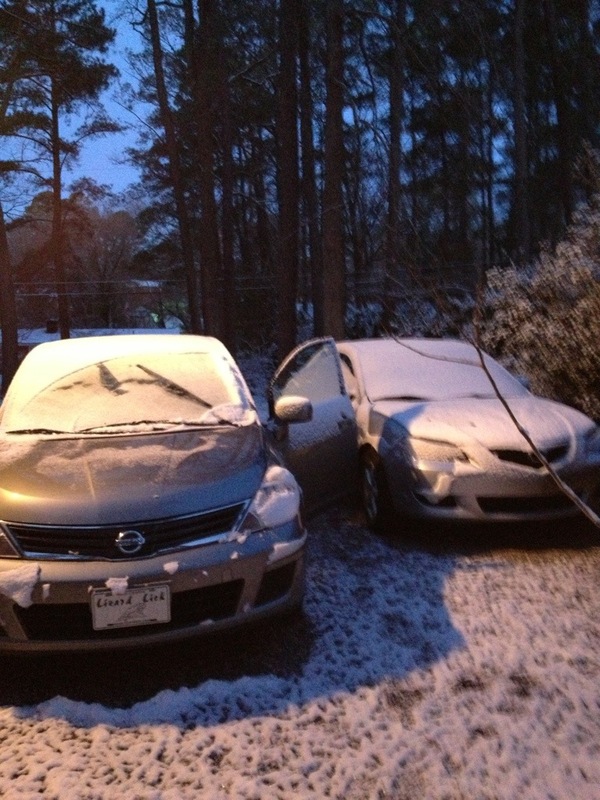 We had a light snow yesterday that became sleet later in the day then back to light snow all night. 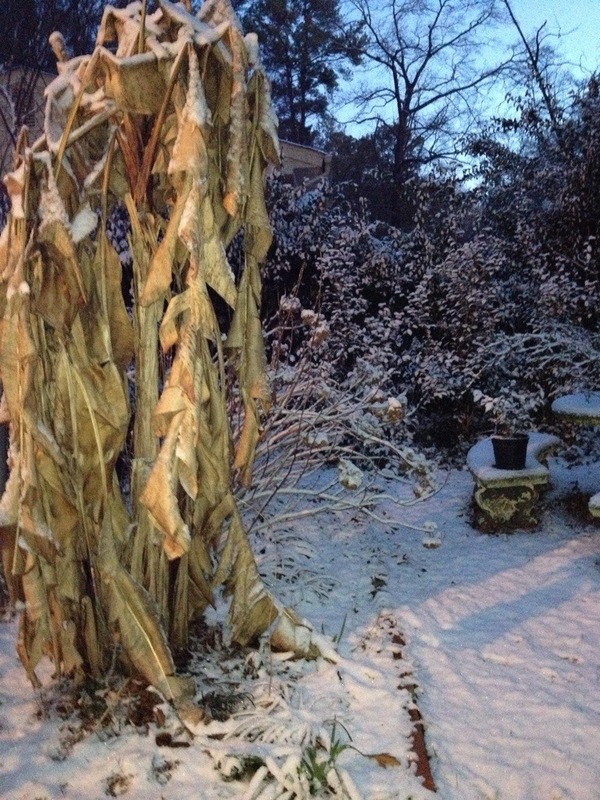 Its beautiful on the garden since it wasn’t heavy enough to caused damage to the trees or shrubs. 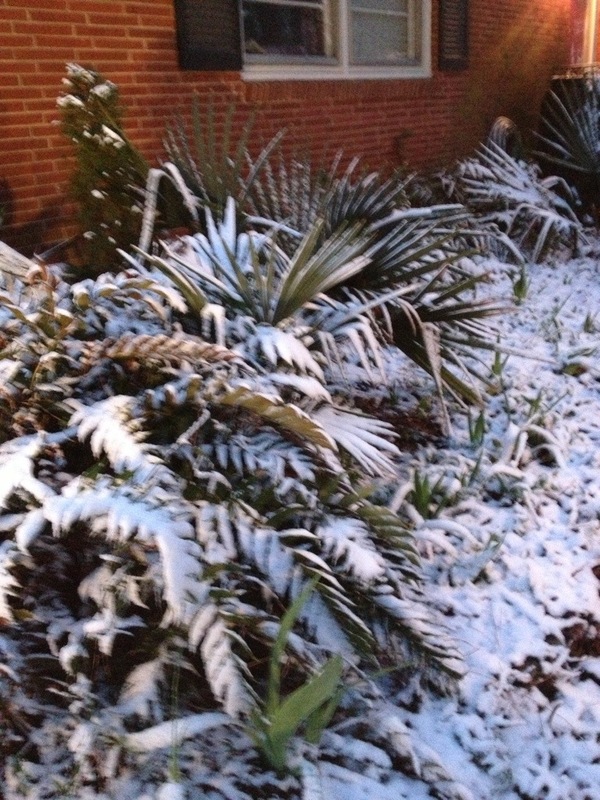 Snow on the Dwarf Palmettos and Holly Fern. 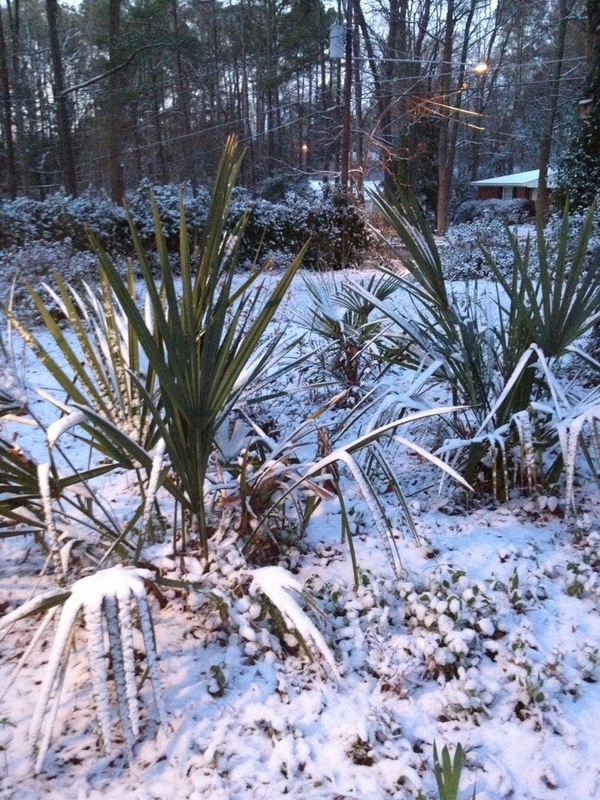 Front yard along the drive. 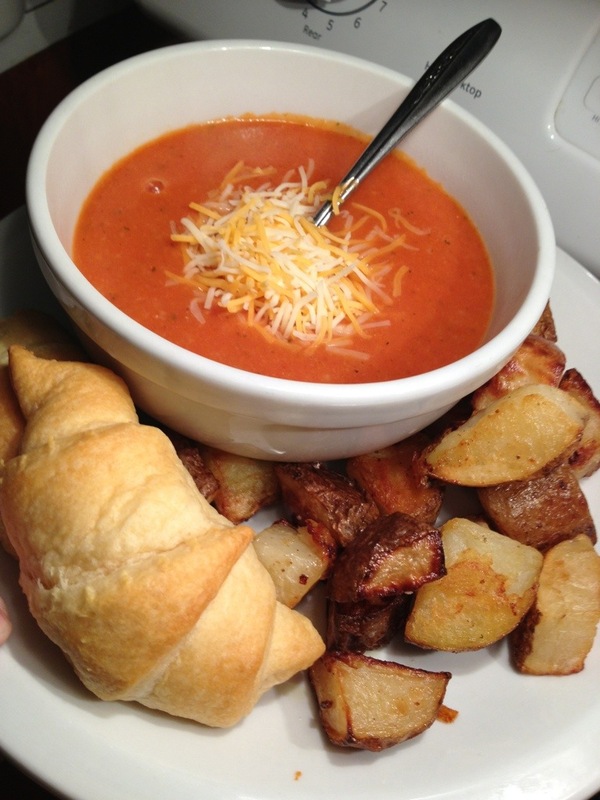 Dinner last night was tomato soup with roasted potatoes! I will add the recipe later today.